While agile has been historically used in software development, its success in helping organizations “build the right stuff, fast” has led to its use in other disciplines – including marketing. It’s been a little over a year since I left my private consulting practice to join CA. During this past year, to say that I’ve grown a lot as a marketer and a member of a team would be an understatement. Every day I’m surrounded by agile coaches and consultants who are dedicated to transforming the clients they work with and help them produce better products, create better teams, and become better leaders. It’s hard to be around all of this passion for the transformative powers of agile not have it rub off. Becoming agile has strengthened not just my collaboration muscles, but it has also made me a better servant-leader, ready to guide team members to become better marketers in their own right, which in turn strengthens the whole team. Becoming agile has made me more empathetic – and it’s demonstrated in different ways. Before agile I may have expected sales to care about a marketing initiative that may have had nothing to do with their own current goals. Today I make sure that our marketing plans are tightly aligned to sales goals – which has the added benefit of the materials getting used by sales and all of the hard work we put into creating the marketing initiatives actually paying off. Becoming agile has given me a better ability to pivot as needed – but only after clear feedback from the market. Plus, it has allowed me to “not fix what ain’t broken” – if the feedback is good, then I leave it be. Becoming agile has also made me focus more on “outcome over output”. As marketers it’s much more important for us to focus on whether or not the 30 new blog posts are doing anything to drive our pipeline – there’s no need to create more output for the sake of more content. We may feel busy, but if we’re not busy doing the right things, then we’re wasting everyone’s time and money. For those of you not in the loop, here’s a brief description of the agile methodology. So What is Agile Anyway? Of course this doesn’t mean that only the “left side” of the equation matters – it’s just that it’s more important than the right. How Does Agile Apply to Marketing? It’s no secret that marketing is constantly changing. Not only is CMO tenure shockingly short, but the array of available tools and the constant changing consumer landscape can make even the most even-keeled marketer keel over. But I’ve found that if you start to immerse yourself into agile principles (as outlined above), all of this chaos gets a lot more manageable. Agile sprung from the chaotic world of software development – so it’s no surprise that its principles can be applied to stronger marketing strategy and execution as well. 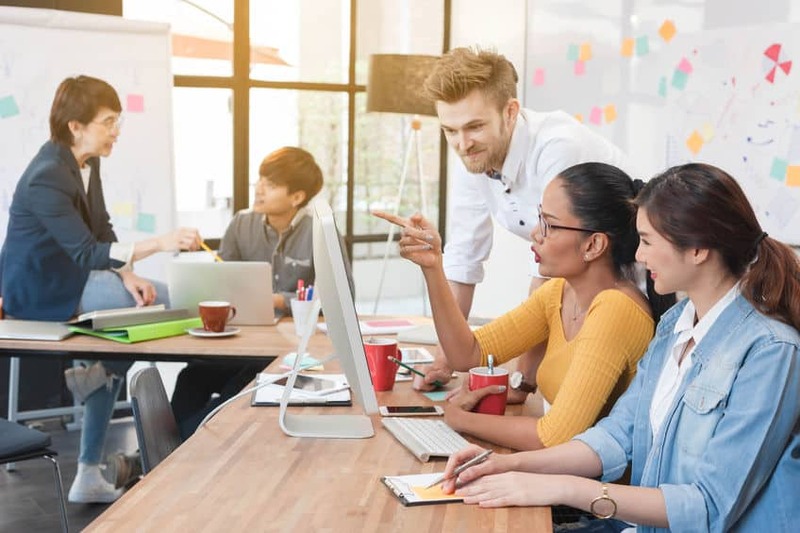 One of the key pillars of agile is all about people, and in order for you to create powerful marketing strategies for your business, you need to focus on your CUSTOMERS FIRST. Too often, marketers get sidetracked by the brightest, newest shiny objects. Whether it’s a new social platform, new tracking tools, fancy automation tools, our eyes will light up like a kid in a candy store. But it will all fail unless you keep the customer front and center. As an Agile Marketer, everything I do – copywriting, strategy, sales enablement – comes down to putting the customer first. And putting the customer first goes WELL beyond your basic persona building. When you put the customer first, you invariably start asking tough questions. How does my customer want to hear from me? Does my customer even WANT to hear from me? If I’m “interrupting” them (emails, ads, phone calls), am I really bringing them information that they need to hear in order for them to be successful? Am I giving them WHAT they need? It really starts to come down to servant leadership. It’s no longer a game of, “buy, buy, buy” but “help, help, help”. That doesn’t mean you have to ignore the sell – it’s the sell that keeps a marketer employed – but every message should keep the customers business or personal outcomes top-of-mind. Just as in business – marketing changes FAST – and being an agile marketer helps you keep up… a LOT. It’s not about doing more, faster – it’s about doing the RIGHT things, faster. It’s about creating 2-3 Google AdWords and putting them to a test within 2 weeks, and then mercilessly throwing out the content that doesn’t work until you come up with the perfect ads – based on statistically relevant data (because if a customer isn’t clicking and converting, your messaging is wrong). It’s about getting together with your team to create a marketing strategy that’s chunked into 13-week sprints. This 3-month cadence allows you to both plan for the short-term, but also react to changes (both internally and externally) in a calm, reasoned fashion. In short – unless you’re “bleeding”, if it’s not the sprint, it has to wait. It’s about constant input from your customers. Ads not converting? That’s the same as a customer telling you to your face that they don’t want what you’re selling. White Paper not getting downloaded? Same thing – your message is wrong. Being agile means you’re reacting to what your customers are “telling” you all the time. Trick question – for a marketer, who is your customer? When it comes to collaborating, everyone (internal and external) is your customer. Your customer is your sales team. Nothing drives me crazier that a company that doesn’t have their sales and marketing teams meeting regularly and building plans together. Marketers need to fill the pipeline – and sales needs to tell marketers who they need to talk to. Sales is on the phone with customers ALL the time – they know the common questions, the requested features and functionality, what’s working in the field and on the shelves, etc. Your customer is your support team. Your support team hears it all – the good, bad and really ugly. Collaborating with your support team is a GREAT way to get ideas for content (How-to Guides anyone?). They’re also an excellent resource for common questions and complaints, which you can then turn into additional content. Your customer is other marketers. If you work in a large organization, it’s possible that there are multiple marketing teams. Sometimes these teams are siloed based on products, target customers, delivery method, etc. But just because the company says you should be in a box, doesn’t mean that it makes sense to stay in a box. Collaborating with other marketers in your organization gives you access to fresh ideas, possible new tools, and more opportunities to improve your own strategies. Plus, oftentimes when you talk to other marketers in your organization, they may have content you can cross-promote (saving you and your team some time) and visa versa. Just because your organization says your siloed doesn’t mean your external customers see it that way. Your customer is your targeted customer. Sometimes you can speak directly with your customer – have them test your product in a small group and provide feedback as you develop. Other times you may not be able to directly speak with your customers, but you can still get their feedback. Sure, surveys are fine, but who really answers them? You need to make sure you’re “listening” to your customers all the time. Maybe they’re complaining about a competitor’s product on social media. Maybe their testimonials are giving you insight into what your company is doing well. Maybe the media is doing your research for you, revealing key insights into a marketplace you’re in or are planning to enter. In short, these days feedback is everywhere. Raise your hand if you’ve ever in your career spent 6 months writing up a single creative brief, conducting comprehensive market research, designing packaging mock-ups, developing a 60-page presentation deck and more. But how DO you plan? We can’t just throw spaghetti against the wall and hope that something sticks. I’m not suggesting you DON’T plan – but the plan you create should have a built-in response to change, inspect and adapt. At CA, our marketing team holds Big Room Planning (BRP) every 13 weeks. Everyone is invited – product development, sales, members of other marketing teams – and as a team we make more creative decisions, identify issues more quickly through the lens of “uncommon” team members, and build a stronger, less-siloed team. But that doesn’t mean that planning is the only time we collaborate. Smaller teams are constantly getting together and fine-tuning their initiatives. As I mentioned earlier, being on a 3-month cadence keeps the timespan short enough to allow us to pivot quickly if needed, but also long enough to give us the time to execute upon the plan in a thorough way. Also, at the end of each 13-week cycle, our retrospective readouts will identify what programs are working, where we need more time, and where we bit off more than we could chew. While these are only a few key points based on the Agile Manifesto, getting my agile on has broadened my perspective on how I can do the right things for my team, my company and most importantly, our external customers. So what do you think? Would you consider yourself an agile marketer? Do you think it’s something your organization would support?